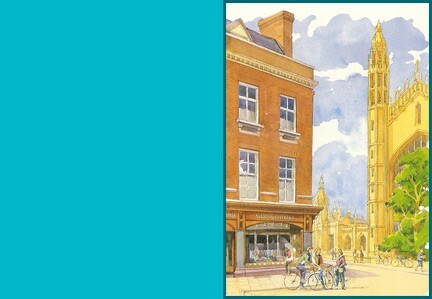 Ryder & Amies, outfitter to the University of Cambridge for over 150 years, supporting the Cambridge Colleges and Clubs. Historically it was a gentleman’s tailoring and robe outfitters, established around 1850. The business was founded by Joseph Ryder (1831-1900) and in 1896 Edward William Amies (1862-1941) took on a partnership with Mr Ryder. Edward William Amies was a founder member of the Cambridge Chamber of Commerce and held the office of Mayor of Cambridge during the period 1927-1928. Joseph Ryders grandsons did not have any children, thus ended the Ryders’ link with the business. Today it is still run by descendants of the Amies family. The Amies family continued to ensure the business flourished and moved along with the modern day. Gordon Amies (1914-2002), grandson of the original partner Edward Amies, and his wife Wilhelmina James Amies (1914-2006) became partners and took over the business. Gordon’s daughter Carol Amies (1940-2005), and her husband, Ivan Chamberlain (1932-2003) later took on the business. Today the business is run by the fifth generation of the Amies family, Carol’s sons Tony & Steven, and has grown from a simple tailors shop into the University Store it is today, serving students and tourists alike.